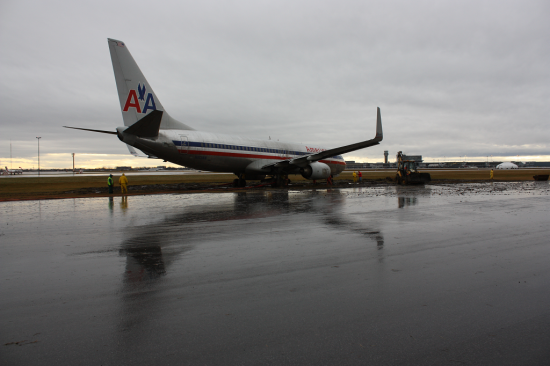 The Transportation Safety Board of Canada (TSB) released its investigation report into the 30 November 2010 runway excursion of an American Airlines Boeing 737-800 at the Montreal/Pierre Elliott Trudeau International Airport. The report raises concerns about un-commanded nose wheel steering incidents on Boeing aircraft. The Boeiing 737 was on a flight to Montreal, Quebec from Dallas, Texas with 113 people aboard. The aircraft landed normally on the wet runway in a crosswind. As the aircraft was slowing down, it veered, un-commanded by the crew, towards the left side of the runway. The captain, the pilot flying, tried using the rudder and the nose wheel steering tiller to steer the aircraft back to the runway centerline. Although the aircraft heading started to return back towards the runway heading, the aircraft continued to travel towards the left and exited the runway surface. There were no injuries and damage to the aircraft was minor. Investigators found that the un-commanded veer to the left of runway centerline was likely due to a jam in the nose wheel steering system. Following the occurrence, investigators did not find any anomalies with the nose gear wheel system, as the jam likely cleared up. The flight crew did not receive any indication that a problem existed with the nose gear steering system, nor is there any written procedures to manage a nose wheel steering problem of this kind. The aircraft’s flight data recorder (FDR) does not record parameters from the nose wheel steering system, thus making it difficult to determine when and how problems with nose wheel steering occur. There have been 11 similar occurrences reported involving various Boeing aircraft types in the past 21 years throughout the world. The cause of these un-commanded nose wheel steering occurrences remains uncertain, despite post-event examinations and other efforts to analyze them. The manufacturer’s safety review process has deemed these occurrences to be an acceptable risk given their remoteness, and the manufacturer has not taken further action to correct them. 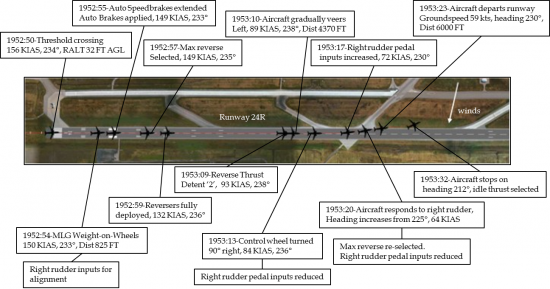 As their cause is uncertain and because little is being done to better understand the problem, TSB is concerned that there remains a risk for runway excursions to occur. Following the accident, American Airlines now discusses this occurrence as part of recurrent training for its flight crews. This training is given to the flight crews to raise awareness of the possibility of a runway excursion due to a nose wheel steering problem after landing.